The U.S.Air Force Research Laboratory is planning a small experimental satellite thatwould orbit in close proximity to a host spacecraft and keep tabs on theirsurrounding space environment. Thelaboratory's space vehicles directorate, located at Kirtland Air Force Base inNew Mexico, plans to fly the experiment in 2009, according to a request forinformation sent to industry Nov. 15. 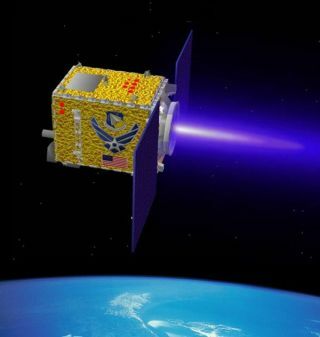 Plans callfor awarding up to three study contracts for the Autonomous NanosatelliteGuardian for Evaluating Local Space (Angels) this coming spring, said TomCaudill, the space surveillance technical area lead at the laboratory. A singlecompany likely would be chosen in 2007 to build the demonstration spacecraft,he said. Caudillacknowledged the program's schedule and $20 million budget are challenging. Buthe said those constraints were chosen deliberately to help stimulate designsfor relatively simple, low-cost satellites that can be built quickly, he said. "We'retrying to change the paradigm--to push contractors to do this quicker andcheaper," Caudill said, noting that the military is making a developmental pushin this direction with efforts like TacSat. The Angelssatellite will be launched into a geostationary orbit for an experiment that isexpected to last about a year, according to the request for information. TheAir Force hopes to extend the mission for another two years, according to therequest for information. Geostationaryorbit is a belt of space some 36,000 kilometers above the equator that hostsmost communications satellites. The Air Force chose that orbit because itsdistance from Earth's surface makes it less visible and more difficult tomonitor than lower orbits, Caudill said. The Angelsspacecraft would launch along with a yet-to-be-determined host satellite thatit would shadow in orbit, Caudill said. The launch likely will be arranged bythe Defense Department's Space Test Program, he said. Caudillsaid a full range of contractors, large and small, have expressed interest inthe Angels project. "The smaller firms are maybe a little more able to livewithin the cost than the bigger ones, but even the big houses are lookingseriously at what they can do to make this work," he said. Prospectivecontractors will be given the chance to define much of the satellite'scapability, Caudill said. Those capabilities could include monitoring spaceweather conditions, detecting anti-satellite weapons and diagnosing technicalproblems with the host spacecraft, he said. Biddersmust use relatively mature technology for the Angels program, Caudill said.Individual component technologies must be proven by the time bids are submittedin May 2007, and their ability to operate as part of an integrated system mustbe demonstrated by December 2008, he said. The AirForce Research Laboratory's work on small orbit-rendezvous satellites such asXSS-10 and XSS-11, as well as advances in component miniaturization, havehelped lay the groundwork for Angels, Caudill said. Meanwhile,the lab also is working on an experimental space-based optical telescope thatcould monitor distant objects in space, according to the request forinformation. Caudillsaid that effort is not as far along as Angels, but that the telescope would bemounted on a significantly larger satellite, though one that is smaller thanmost platforms used by the Air Force today. TheresaHitchens, director of the Center for Defense Information, a think tank here,said better space surveillance capabilities are urgently needed by the AirForce. "It needsto be done and pronto," she said. Hitchens in the past has called forimprovements to U.S. space surveillance systems to help U.S. satellites avoidcollisions with other spacecraft as well as orbital debris. ButHitchens also sees potential problems with a mission in which one satelliteclosely shadows another. If a spacecraft were to stray too far from its host itcould be viewed as a threat by other nations operating satellites in the area,she said. "If theChinese were doing this, you can bet that the U.S. Air Force would beapoplectic," Hitchens said.